How many of us suffer with some kind of skin problem? Ranging from pimples, acne, uneven skin tone and even sensitivity of the skin, just to name a few. How many of us spend a lot of money on face wash, astringents and other facial products? Products that works at one time and fails us miserable at another time. African Black Soap has been raved about on the internet for some time now. Like any other hyped product, it had me wondering if I would really see results. To satisfy my curiosity, after much researching and looking at reviews on YouTube about sellers and of course the Black soap, I went ahead and ordered it. Upon receiving the Black Soap, which was a huge block, I decided to cut it up and share it with my family to get their thoughts on it. After using the Black Soap for some time, they reported to me that they have seen improvement on their faces; from their ache clearing up to the toning of their skin. They also used it on their entire body and found that it left their skin feeling smooth and fresh. I have experience some results from using it on my face as well, and for someone who suffers with acne, I am happy to announce that my acne is finally under control. One should keep in mind that the Black Soap deals with the outer part of the body and one should also ensure that the inner part of the body is also taken care of. I will continue to use the black soap as it’s one of the few products that I have use and fallen in love with. Raw African Black Soap is 100% Vegetable Base and contains mainly water, cocoa pod ashes, plantain skins ashes and palm oil. 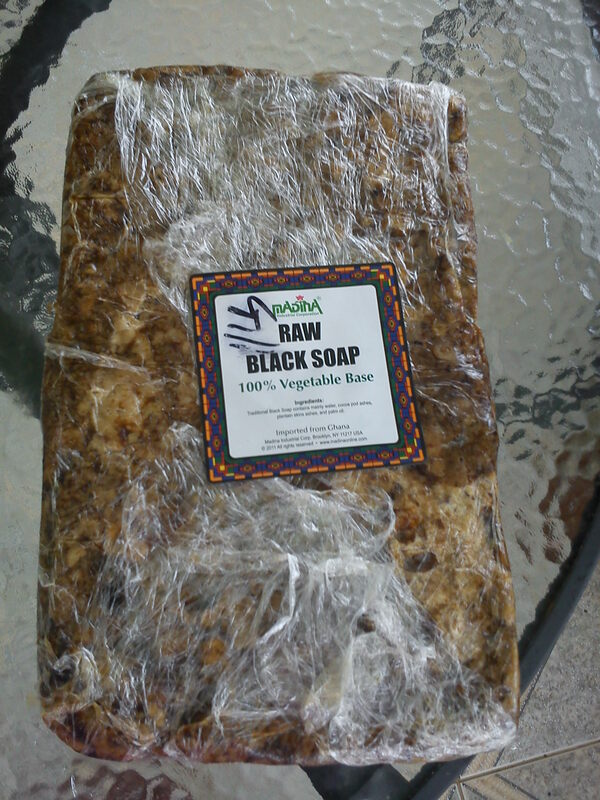 Despite the name being African Black Soap, the soap is not black but brown. It is a natural source of vitamins A & E and iron. Based on my research of the African Black Soap, it is an all-natural cleanser that can be used for cleaning of pores and does not irritates the skin; it also removes makeup thoroughly, helps with pigmentation of the skin and alleviates pimples, scars from pimples and black spots. It can be used on all types of skin and in the hair. It is advice, after washing the face, whether it is with the Black Soap or any other product, to use a moisturizer to help the skin to retain and seal its natural moisture and create a barrier that prevents the drying out of the face. A little goes a long way as the African Black Soap produces a lot of lather.